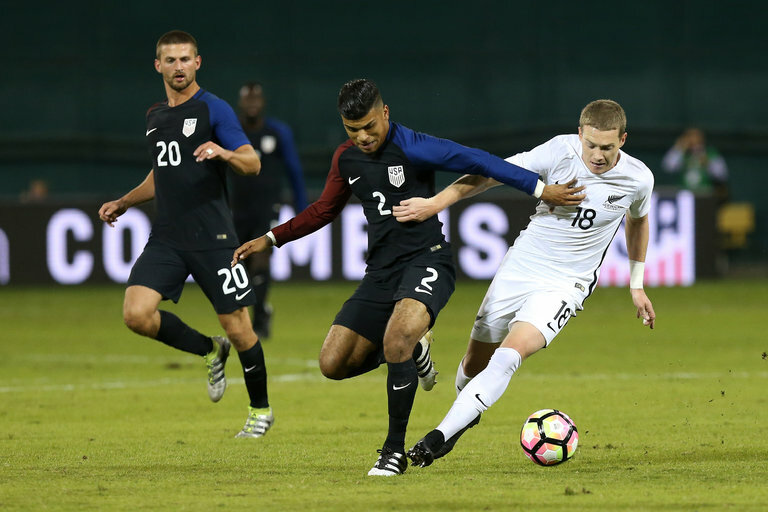 United States defender DeAndre Yedlin, center, and New Zealand defender Kip Colvey battled for the ball during the first half. WASHINGTON — Julian Green scored his second goal in two matches, but Monty Patterson evened the score and forced the United States men’s national team to settle for a 1-1 draw in an exhibition against New Zealand at R.F.K. Stadium on Tuesday night. Lynden Gooch, 20, made his debut for the team as a second-half substitute in a match played exactly a month before the Americans face Mexico to open their final round of World Cup qualifying. Goalkeeper William Yarbrough kept New Zealand scoreless over 45 minutes in his first international start and his third appearance for the national team over all. David Bingham could not do the same in the second half, though he could hardly be blamed for Patterson’s goal.